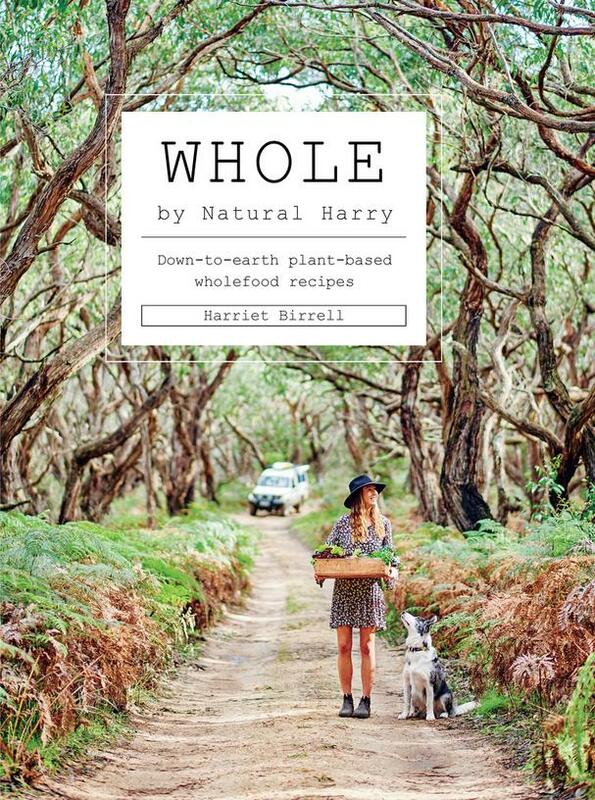 When I cracked the spine of Harriet Birrell's new cookbook WHOLE: Down-to-Earth Plant-Based Wholefoods Recipes I couldn't wait to get into the kitchen. This beautifully photographed book, shot in Harriet's rural hometown of Victoria, Australia, is chockful of nourishing and satisfying dishes with modern twists. Harriet (known as Natural Harry) includes wholesome dishes for every meal of the day with chapters covering Brekkie (aka Breakfast), Bowls, Salads, Mains, Share, Sweet, Drinks, and Basics, plus the necessities for a plant-based pantry. 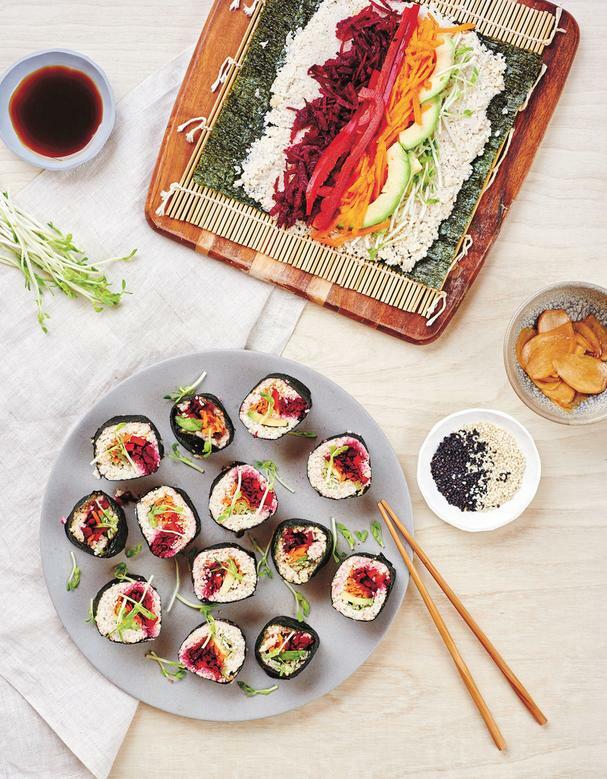 You'll love the deliciously healthy Raw Rainbow Sushi with Quick Pickled Ginger (recipe below), and best of all, they're easy to make! Just swap out sushi rice and use a blended mixture of riced cauliflower, cashew nuts, and sesame seeds - brilliant! Be sure to check out her Middle Eastern Stuffed Eggplants on page 118. The roasted eggplants are stuffed with a tasty mixture of cauliflower, mushrooms, walnuts, onions, dried cranberries, and cumin, then drizzled with a Middle Eastern-spiced yogurt sauce. It's garnished with fresh cilantro and mint, pomegranate arils, toasted pine nuts and a spritz of lime juice. This is one flavor-packed dish! For dessert, try her Nut-Free Probiotic Choc Mint 'Ice Cream' Cake on page 194 (pst...it's made with sweet potatoes, but you'd never know!). WHOLE is for anyone who wants to up their vegetable game - and enjoy every mouthful of it! Recipe excerpted with permission from Whole by Harriet Birrell, published by Hardie Grant February 2019. Photography by Nikole Ramsay. "This recipe is based on traditional sushi but it doesn’t have many of the same ingredients. I’ve kept the main one, the nori, which is traditionally made by shredding and rack-drying seaweed. Organic nori wraps hold impressive amounts of nutrients including iodine. All of that nutritious seaweed wrapped over colourful crunchy veg and cauliflower rice certainly makes for a nourishing meal or snack." Add the cauliflower, cashew nuts and sesame seeds to a food processor and pulse until a rice-like texture is achieved. Place a nori sheet on a bamboo rolling mat. Spoon on a generous amount of the rice mixture and spread it three-quarters of the way across the nori sheet beginning 2 cm ( ¾ in) from the end. Layer with the raw veggies. Carefully roll your sushi two-thirds of the way and gently squeeze. Lightly brush the opposite side with some water before rolling all the way and gently pushing closed. Repeat this process until all the ingredients are used. Slice with a wet sharp knife, garnish with pea shoots and serve with the coconut aminos, quick pickled ginger and, if you like, sesame seeds. Combine the ingredients in a jar. Shake to combine. Store the pickled ginger in an airtight glass jar in the fridge for up to 2 weeks.